It’s time to face the music. And by “music” I mean “the goat meat piling up in our freezer.” Our monthly meat CSA sends us amazing beef filets and spare ribs, rose veal chops and kabobs, lamb sausage and shanks… and goat meat. Lots of goat meat. Which, through no fault of its own, keeps getting shoved deeper and deeper into the freezer. My reluctance to deal with the goat meat had nothing to do with the animal itself, even though I’d been menaced by a gigantic angry mountain goat on our elopement hike in Colorado (long story; I don’t want to talk about it). Nor did it have to do with any sort of you-want-me-to-eat-goat-meat? squeamishness or nice-clean-people-don’t-eat-goat-meat snobbiness. The most widely consumed meat in the world, goat’s making its way onto restaurant menus and food-lovers’ radars. New York Magazine and the New York Times both recently ran articles on the phenomenon (prompting one reader to comment “Here are white people again!!! Acting like they invented goat meat.”). We’ve braved long waits at rainy bus stops and hourlong rides on public transportation to get to Birrieria Reyes de Ocotlan, a tiny diner-ish joint in Pilsen that specializes in goat consomme and tacos filled with braised, shredded goat meat. Goat meat’s rad. I just didn’t know how to cook it. Not one of my cookbooks (and at last count there were over 90 of them) had a single recipe for, or word about, goat meat. Internet searches weren’t super-helpful either. Goat meat is also referred to as chevon, kid and cabrito, but I couldn’t quite nail down whether those terms were interchangeable or were related to the age — and therefore toughness — of the meat. To complicate matters even further, our packages of goat meat had labels identifying them as medallions, kabobs and chops — titles which didn’t really help identify which part of the animal it originally came from, or what age the animal was, and therefore didn’t give me any clue about how to prepare it. The word kabob makes me think, naturally, of grilling — but what little I’d read about goat had suggested slow, low-temperature, liquid-based cooking methods to counter its natural toughness. But I wasn’t about to spend ten hours oven-braising a pound of goat meat at 200 degrees, so I needed some sort of compromise. 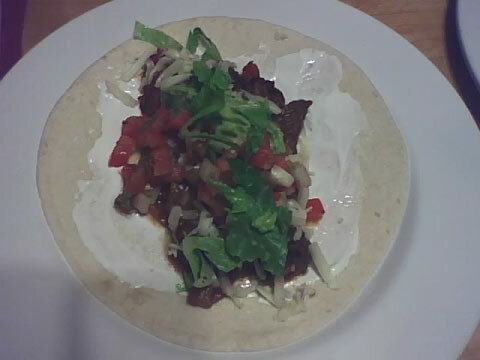 After a quick survey of the fridge and pantry turned up pepper jack cheese, flour tortillas, a can of diced tomatoes, half an onion and a spice jar labeled ‘mole’, I decided on pan-braised goat tacos. But first I had to take a detour, because this spice jar — labeled in my handwriting — was throwing me for a loop. I found similar jars, with nearly identical-looking ingredients, labeled ‘Moroccan,’ ‘seafood,’ and ‘duck/game.’ (How do I have absolutely no memory of assembling these?) After a lot of hands-on-hips staring at the jars, and a little web searching, I remembered that the jars had been the result of my reading Sally Schneider’s The Improvisational Cook. To make her mole-inspired seasoning, combine a heaping 1/4 cup ancho chile powder or smoked paprika (also called, for those of you who’d rather think of goat as ‘chevon,’ pimenton de la vera), 2 tablespoons brown sugar, 1 tablespoon ground cumin, 1 tablespoon (unsweetened) cocoa powder, 1 tablespoon cinnamon, and 2 teaspoons oregano. Store in a jar and use, preferably before pantry amnesia strikes, with a teaspoon of salt for each tablespoon of spice mix. Goat/chevon/cabrito/kid seemed like it would benefit from marinating, so I tossed a pound of cubed goat meat into a plastic zip-top bag, along with two crushed garlic cloves, half an onion, thinly sliced, 1 tablespoon of mole mix, 1 teaspoon salt, and about 1 tablespoon of extra-virgin olive oil. I closed the bag, massaged everything until it was good and coated in spice paste (adding a little more olive oil because it seemed dry, but use your best judgment), then set the bag in the fridge and ignored it for a few hours. 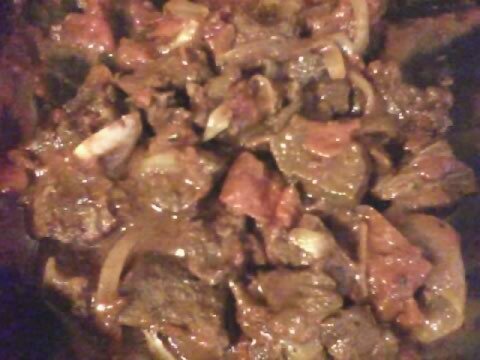 When it came time to cook, I dumped all of the bag’s contents directly into a cold pan, then spooned/dumped the contents of a 14-ounce can of diced tomatoes on top of the goat-onion mixture. I turned the heat on super-low, covered the pan, and walked away. After a half-hour, the place started to smell amazing. I tasted the goat, and it was pretty chewy. Overcooked? Undercooked? I gambled on the latter, stirred the meat, re-covered the pan, and came back 30 minutes later. The meat was much more tender, but by no means fall-apart-tender. But we were hungry, so we ate it then and there. The flavor was awesome, even if we were too impatient to wait any longer (I’ll bet another half-hour would’ve been fine). The cinnamon and cocoa really shone through, but didn’t overwhelm; in fact, they kind of toned down the acidity of the tomatoes. Goat’s got a darker, earthier taste than lamb, so it’s a perfect foil for rich, earthy spices. I think the Moroccan spice jar might make an appearance when I get around to the package of goat kabob meat. Goat tagine, maybe?